In this tutorial, I'm going to show you how to make a cheap controller or converter using a Pro Micro. 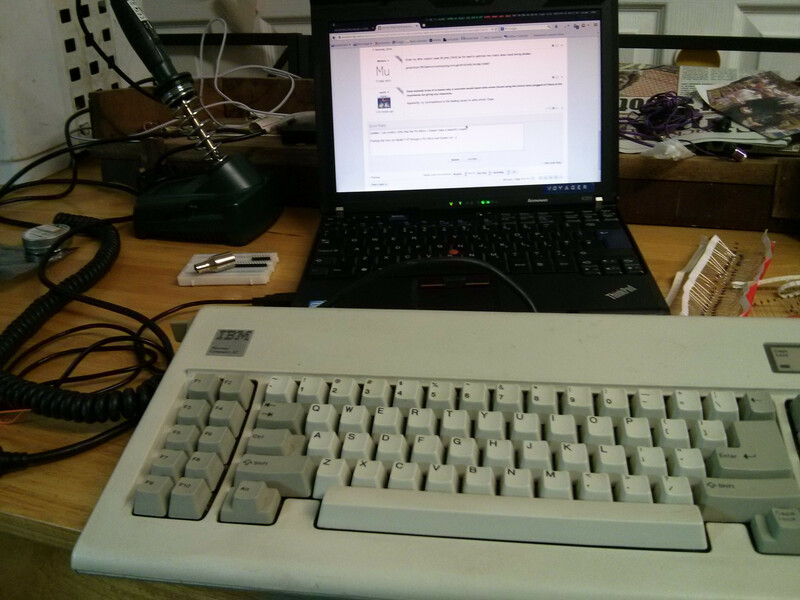 This tutorial will specifically talk about using it for Pro Micro for an AT-style 180-degree DIN5 so that I can remap keys on my Model F, but it should be applicable for other uses. - They're cheap - you can get them for less than €3 €5 (price increase ), whereas Teensies are upwards of about €15 or above. - They have enough pins for a converter - Soarer's converter only requires four pins, and the Pro Micro has all of the required ones. - It's more difficult to flash: you need to short pins manually, and use a command-line tool to flash hex files. No Teensy loader here. - It has fewer pins than a Teensy. 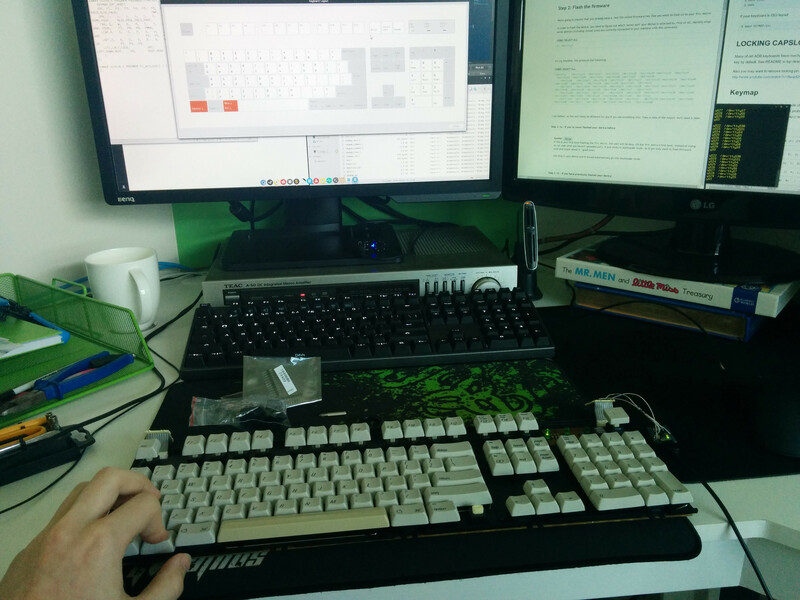 For something small like a Soarer Converter, or maybe a hand-wired numpad or a heavily optimised PCB, that's fine. However, if you're hand-wiring a larger board, I'd recommend a board with more pins so that you don't have to worry about wiring a complicated unintuitive physical layout. This guide should be applicable to both GNU/Linux and Mac OS X. I wouldn't know where to start figuring some of this stuff out on Windows, but if there's demand then I'll try. I don't have any devices that run Mac OS X, so if anything is incorrect then please let me know and I'll see if I can get them fixed. This part is easy, but takes a lot of time. You can get them on eBay for about €6 shipped, and also on AliExpress at a slightly lower price. They will both take a long time to arrive, with the eBay link coming from Hong Kong and the BangGood one coming from China. Mine took about 3-4 weeks from eBay. We're going to assume that you already have a .hex file called firmware.hex that you want to flash on to your Pro Micro. I run Debian, so this will likely be different for you if you use something else. Take a note of the output, we'll need it later. If this is your first time flashing the Pro Micro, this part will be easy. On the Pro Micro's first boot, instead of trying to run code (that you haven't uploaded yet! ), it just sticks in bootloader mode. So if you only want to flash firmware once and forget about it - good news. Just plug in your device and it should automatically go into bootloader mode. If you've previously flashed your Pro Micro, instead of going straight into bootloader mode it will try to run the code that you uploaded to it. To go into bootloader mode, you need to quickly connect the GND + RST pins twice, just as the device powers on. There should be one more output device than was seen previously. For me, it's /dev/ttyACM0. To flash the device, you need to have AVRdude installed. On Linux, you can do this with your normal package manager. On Mac OS, I've heard from a reputable source that you need to install CrossPack. Once it's installed, confirm that it works by just running avrdude on the command-line. It should throw some errors. If so, it works. If it says ''device not in sync'' or similar, your device is no longer in bootloader mode. Unplug it, and get it back into bootloader mode like you did in the previous step, and try again. 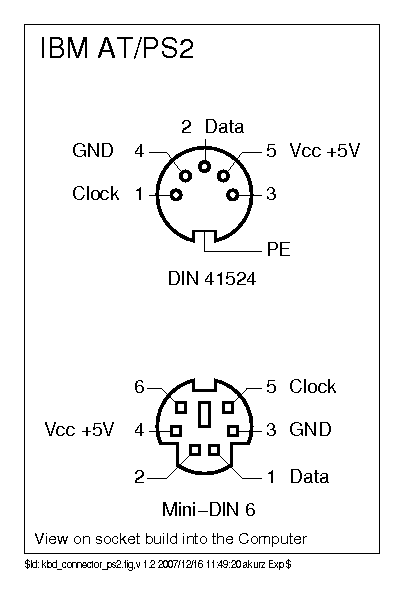 With both of these, it's easy to go between Teensy and Pro Micro pinouts for other guides that are Teensy-specific. ...and it works! Aaaaah, my wonderfully chunky Model F.
- Soarer for his firmware, of course, and also the Pro Micro pinout diagrams, and help on IRC with bootloader mode on the Pro Micro. - Muirium for pointing out CrossPack on Mac OS X. Last edited by scottc on 11 Apr 2015, 12:18, edited 4 times in total. Great work scottc!Will come in handy! Just a note though, the Banggood URL is for the Pro Mini (ATmega328) not the ProMicro. Thanks! Good catch, I got the link in a hurry and mustn't have realised. I'll change it now. Edit: I changed it to an AliExpress link. It's not great, but it should be an option for people who can't or won't use eBay, at least. Thanks. Will try to get this working on Windows when I get my boards. The process should be pretty similar on Windows, I just have no idea about either WinAVR or how Windows serial ports work. scottc wrote: ↑ The process should be pretty similar on Windows, I just have no idea about either WinAVR or how Windows serial ports work. Yeah I believe that as well. And I will look into that and post here when I have straighten it out. But I need to migrate to Linux soon... But I'm a gamer as well and Linux and games are not best pals yet, even if they have been acquaintances quite a while now. The pro micro I have bought is in the mail. After they arrive I will post here. I agree. GNU/Linux is getting there with gaming, but Windows still has an unfortunate advantage. GNU/Linux is a far superior development platform for me, though, so that's where I spend most of my time. GNU GNU GNU. Apparently I've taken to saying "GNU/Linux" recently. @scottc: Are there any differences in specs corresponding to the color of the board? Your illustration shows a red board, whereas the ones I've seen are blue. We want the ATmega32U4 5V/16MHz variety, correct? Thanks. Thanks also for your very helpful guide! I actually don't know of any differences. The diagram above is Soarer's, whereas mine is blue. I suppose that there are many clones floating around. What you've described sounds like the right board. The only thing to be careful about is to avoid buying a "Pro Mini" or similarly-named boards (like I mistakenly put in the OP before chzel pointed out my mistake) - they've got a 328 and not a 32U4, so (as far as I know) they can't do USB HID. You're very welcome for the guide! I'm glad that some people are finding it useful. Hypersphere wrote: @scottc: Are there any differences in specs corresponding to the color of the board? Your illustration shows a red board, whereas the ones I've seen are blue. We want the ATmega32U4 5V/16MHz variety, correct? Thanks. I think the Sparkfun version uses a red PCB, whereas most of the low cost modules on eBay tend to be green or blue. 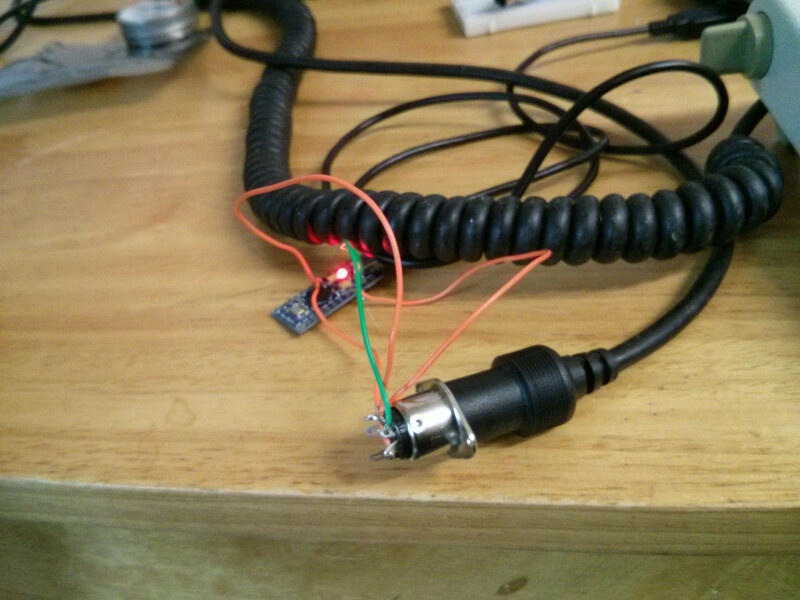 The 5V module runs twice as fast, but will also use a little more power which is not an issue if powered by USB. For a keyboard, if your only connecting to switches and LEDs you could probably use either - I went with the 5V version as I can interface to a PS/2 touchpad without needing a voltage translator. 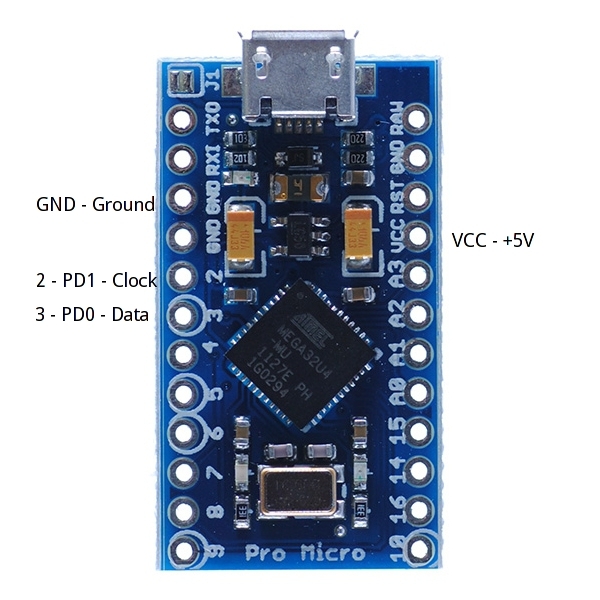 If you are connecting to components with 3.3V voltage levels then the corresponding ProMicro would be simpler. You need access to the reset pin periodically, but in general I can do software updates without pressing the reset first. There are two logical connections via USB - the keyboard and a serial communication link which is used to reset the module. 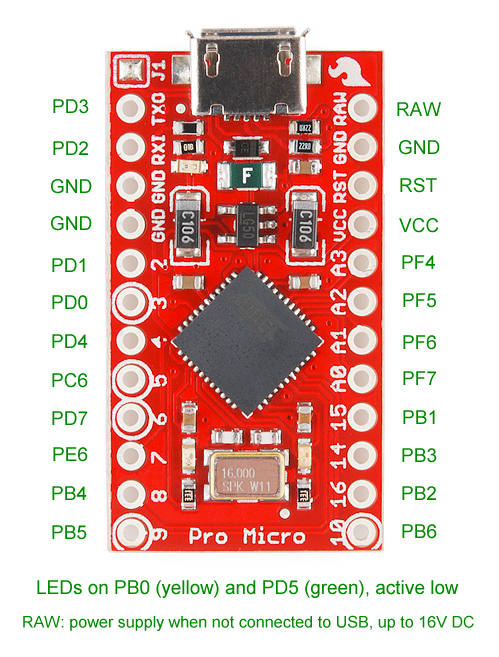 If anyone knows of a low cost source of ProMicro modules I'd be interested - the price seems to have increased significantly over the last few months ($4 to $8). Thanks for the additional insights. I wonder if it might be possible to negotiate a reduced unit price by contacting the seller (link from eBay or AliExpress) and buying larger lots? Thanks for the clarification, PJE! scottc wrote: ↑ Thanks for the clarification, PJE! The rising cost could be attributed to many factors, possibly even including improvements. Speaking of improvements or revisions, this can be rather confusing. For example, some sellers make the following note: "This latest revision corrects the silk error from the last version of the board so that pin 14 is correctly labeled. We've also added a PTC fuse and diode protection to the power circuit and corrected the RX and TX LED circuit." It would be nice if there were revision numbers included with the part number, but buyers might want to look at various listings and choose the one that appears to have the latest revisions. Edit: I've noticed that some sellers have a note saying "Supported under Arduino IDE v____", where the version number can vary from 1.01 to 1.05. Does this matter? Should we be looking for v1.05? I think I saw in another thread that there was low availability on atmega 32u4. Think that's the main reason for the higher price. Supply and demand you know. 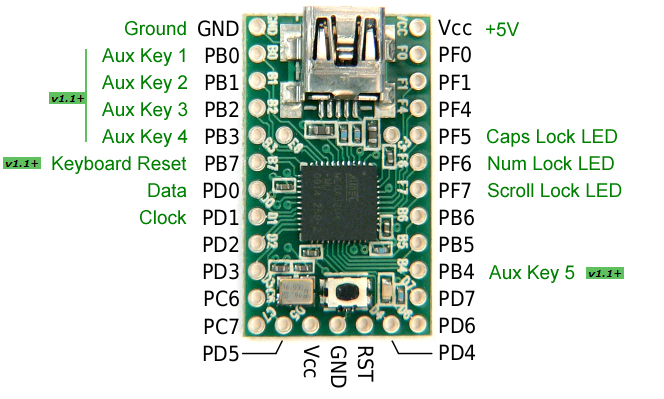 So, basically it is the same as the Teensy 2.0, except there are 18 instead of 25 usable pins? Yep, except you can't use the Teensy GUI application and must use avrdude on the command-line. That's not a problem for me, but some others might be afraid of terminal emulators. Also, I compared it to my Teensy for size yesterday. Somehow, it's larger than a Teensy, yet it has fewer pins. scottc wrote: ↑ Yep, except you can't use the Teensy GUI application and must use avrdude on the command-line. That's not a problem for me, but some others might be afraid of terminal emulators. GUIs are bad anyway. But basically, it is the price that makes it attractive. I agree. It's much better value than the Teensy. Maybe you could use one for the HyperMicro! You won't believe how many times I did that too! Glad it helped. Very good guide, thanks Scottc! Can you give a link to the firmware file? This is all new for me, but I may give this a try. Also, as I am all new to this, can someone give me a list of all the components that I will need? ShawnMeg wrote: ↑ Can you give a link to the firmware file? This is all new for me, but I may give this a try. point 4 is micro USB cable, not mini. And for point 2, don't buy them, just strip them from a cable you don't use anymore (any usb cable wil have 4 cables inside, but you could use old IDE cables or phone cables aswell). Thx. I've used linux a little bit, and have to figure out how to install avrdude. Does anyone know if it's in the Ubuntu Software Center or some other easy way to install it? Thanks for this, will buy one soon for when my XT arrives i has a tennsey but i manged to kill it ( dont ask). Anyone know of a cheap source of 5 pin Female DIN in the UK? Cheap? Well, you can likely save a few pennies going elsewhere, but for under 2 quid it's hardly worth it. Just don't use the USB connector of the Pro Micro as the main connector! They are notorious for breaking off with many uses! Use a pigtail instead (male micro ->male A) and stress relieve the cable!